Woodley Gardens is a membership swimming pool. It belongs to one of EI couples John and Tatiana Bell. 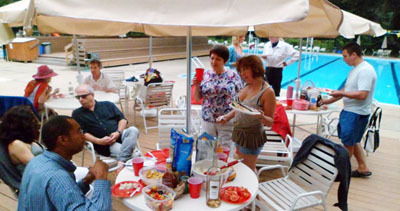 Every year we have an open invitation to bring our social to the pool area and enjoy the zesty grilled food and swimming into the night time, after the pool is closed to the general public. Often times in the past the parties were so enjoyable, the water was so warm and the romance in the air was so intense that we had to pay the guards to stay later than 9 PM, the official closing time for the pool. Otherwise, the entrance is free for EI members. Grills, utensils, seating and music are provided. As usual, we bring the rest -- food for the grill, drinks and snacks, swimming suits and cameras. This swimming pool is known for some of the best pictures ever taken at the socials. This opportunity presents itself once a year. I am looking forward to enjoying it and hope that as many of you as possible will take advantage of it. No reservation necessary. However, if you need a carpool, please confirm. Weâ€™all carpool you from Van Ness metro and from EI Headquarters @Blagden Ave.